China wine club guy Mike Signorelli sent me this article (check this one, too) on deep-fried tequila and it seemed like the perfect thing to try with baijiu. So I talked to Beijing chef / catering guy Dustin Merrett about making deep-fried baijiu and he did a test run this week. 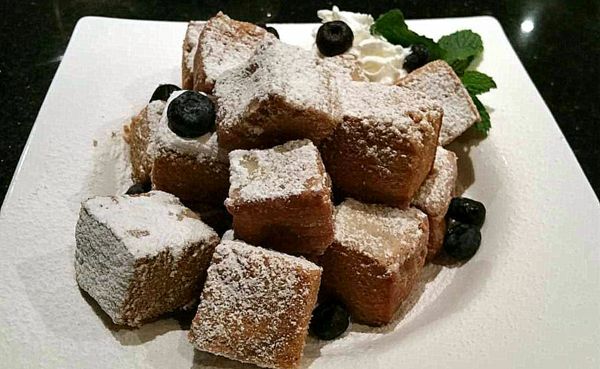 Merrett made his own sponge cake, cut it into one-inch cubes and soaked them with baijiu until they were like a “wet sponge“. Merrett dropped the squares into the fryer for about four minutes, until the outside browned, then removed them, rolled them in icing sugar, and added whipped cream and blueberries. You might lose a bit of alcohol during the cooking process but Merrett says the baijiu blocks still packed a punch. He also tried a light aroma baijiu, by Hong Shin, but found it far less flavorful. Look for more experiments with deep-fried baijiu here next week. Along with using different kinds of baijius, there are all kinds of fun toppings to try. Note: For more info on deep-frying alcohol, check this post.